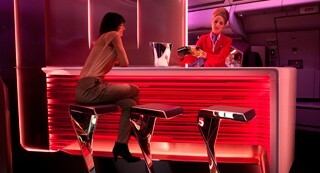 Virgin Atlantic doesn’t seem to disappoint with its new onboard Upper Class offering. Now available for view on their website, the brand new product is similar to that of the previous product, but it seems slicker, more streamlined, a lot more contemporary, and comfortable. The famour purple leather seat is gone, replaced with a slick darker espresso coloured leather, and the dividers look slimmer and a lot more contemporary. Wooden veneer accentuates the product, mixed with other materials such as brushed metal. The herringbone set-up has been improved, with no less space for the passenger. More seats are able to be put in the cabin by using a slightly steeper herringbone, also allowing for a better view out of the window. This is something the previous product failed to deliver. The seat reclines a further 50%, again, an issue that the previous seat created a few complaints over. It’s still a flip-over seat with the real bed cushion on the reverse of the seat. Not to be outdone by their first seat, this one now extends into a whopping 7 foot 2 inch bed. Even the biggest of us should be comfortable. 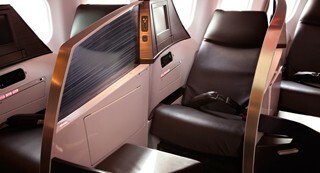 Whilst the images make the seat look narrow, Virgin boasts an increase of 1.5″ width in the suite. Each suite has an improved 12.1 inch (1.5″ bigger than the previous seat ) touchscreen monitor with a touchscreen handset, loaded with their brand new entertainment system called JAM. It allows people to connect their phone, USB stick or tablet to watch, read or listen to their own content and charge devices. The handset looks brilliant, allowing people to swipe through the movie library. Let’s also not forget the cabin now allows onboard mobile phone calls too. If anything the new onboard product does, is make their clubhouses look more dated than the onboard product. But this is great. It’s a fundamental building block for the brand to build its future on and really shows that the airline is investing in their fleet. Personally speaking I cannot wait to experience the new product (as the current 360 seat preview isn’t active at time of post), sipping a champagne off the new cocktail table, and hope that the comfort and quality actually lives up to what the first images actually portrait. Well done Virgin, it seems, you’ve done it yet again! in the airbus and upper deck on 747.
whats happened to big roomy comfy seats in business class…this VAA product is not for me sorry. 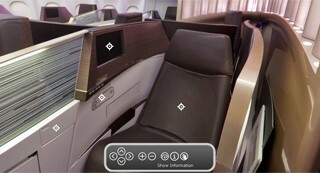 BA club or SQ business on a380 or 777-300 is miles ahead and more comfy. It’s the angle of layout that I don’t like. It places lateral g-forces on take off and more so on landing. I looks good. I’d have to try it before knowing for sure. I’ll put this on my bucket list….just to experience. how does a poor travel writer get a ticket on this endeavor!